Happy New Year! This has been an absolutely amazing year for me. It’s been a year of transformations both mental and physical. There have been a number of very distinct visible changes in my life this year. Most of which are centered around the quality of my life. I’m getting healthier and going out socializing more. In general, it’s made me a happier person. It’s no secret that I’m heavily into gaming. I find them mentally stimulating. My favorite form of gaming is table top gaming. For the most part this has always meant pencil and paper role playing games such as D&D or collectible card games like Magic the Gathering. Then back in 2008 I attended my first gaming convention and that exposed me to a whole new plethora of gaming possibilities. This year I started volunteering for the GameStorm Convention as a social network liaison. This basically means I run their Twitter and Facebook feeds. Through my new friends in the gaming community, I found out about a bunch of other conventions local to me as well. I found myself at ConQuest, OryCon, numerous GameStorm Game Days, and even a couple smaller special events. Many of these I already have on the calendar for attending again next year. I also discovered board gaming in a way I never have before. I used to think of board gaming as Monopoly, Sorry, or even Mouse Trap. If that’s your idea of board gaming, do yourself a favor and look up Fantasy Flight Games, Steve Jackson Games, or Days of Wonder just to name a few. These companies take gaming to a whole new level. The best part of exploring these games has been getting to know the gamers I get to sit down and play them with. The gamer community is filled with creative and brilliant individuals with a common love of gaming. Every game I’ve sat down to play has been a absolute joy. My personal game library has also grown significantly as a result. I play many of these new games with the family but on occasion I gather a few up and head over to friends houses to game with them too. I’ve made a few changes to my Electra Glide this year. Most significant change was a nice set of pipes. She’s got a good strong rumble now. I’ve also made the tour pack detachable so when I’m not traveling I can take it off making her lighter and more fun to ride. We also went for a few rides this year including an over night trip up the Washington coast line with our friends Mike and Amy. We really enjoy that ride and look forward to riding with them again next year when the weather improves. There were plans to hit a rally or two as well but those didn’t pan out. I’m finding I prefer riding in smaller groups with close friends that the big club rides I’ve tried in the past. Back in July I started noticing the runners in my neighborhood. I noticed how it didn’t matter whether it was raining or shining, day or night, hot or cold. The runners would be out putting one foot in front of the other and they always looked happy. It was as if they all shared some big secret together that I wasn’t in on. I was walking quite a bit at this point for exercise and was using Endomondo on my phone to track my miles along with Daily Mile for an exercise log. I was trying to find a way to improve my fitness so I decided to give running a try. It started out pretty well but I got over zealous and over did it. I was out of commission for most of September. I was determined to become a runner though. Once I could hobble down the bock I slowly started back into the running. I spent my down time wisely and learned as much as I could about running. I picked up the book Running for Mortals and it became my running coach. I also started getting more involved with the Daily Mile community who were a significant source of encouragement and advice. On December 5th I ran my first 5k at the Jingle Bell Run/Walk in Portland, OR. The whole process was new and exciting. I found myself wanting to raise the bar almost immediately. I’m currently working on improving my distance and pace. I also have a hand full of races already scheduled for 2011 and have joined the NW Running League. A not so unexpected side affect of the running has been weight loss. You just can’t eat junk and expect your body to perform. On top of that you burn a lot of calories during a regular training routine. When I started running I was not trying to lose weight but the results are spectacular. I was 260 lbs. when I started running and on New Years Eve I officially weigh 214 lbs. I can definitely see a difference when I look in the mirror. I’m not done losing weight and I’ve got a ways to go before I’m concerned about loosing too much. Boy is my doctor going to be surprised at my next visit though. The whole family has been g etting in on the gig too. For the Jingle Bell Run, my son and nephew also ran in it while my wife and daughter walked it. Since then everyone has gotten the running bug. My son also goes to many of the gaming events with me. We also both play in a semi-regular Savage Worlds game with friends. It’s been an excellent social opportunity for him and a real treat for me to be able to share the hobby. My sister in law is also currently in the process of moving closer to us. We’re really looking forward to being able to spend more time with them. There is talk about having a regular family game night together once they get moved. The new year should be really exiting. There are so many cool things going on. I have half a dozen races scheduled out including the Oregon Warrior Dash is September. There are a hand full of gaming conventions I’m already signed up to attend. And there is no shortage of fascinating and challenging games I want to try. Those that know me know I have difficulty with uncharted social situations. This year is bound to take me way outside of my comfort zone. 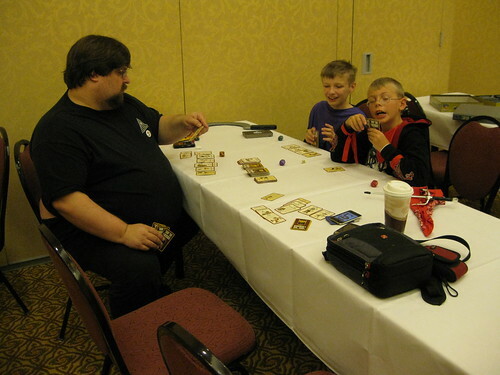 In addition to all of the large public events such as the races and conventions I’m attending, I also plan to run some games at some of the upcoming conventions too. It is also my wish to start working on getting the house suitable for company so I can host a game night here. Having attended a few similar events, I’m exited about the prospect. So here’s to 2011. May the new year bring you all you dream of. I’ve decided to make a major change in my life. I have decided to become a runner. While I was inspired by a gadget, I was enamored with the simplicity of it. I realized that of all the various fitness options at my disposal, running offered the most benefit for the least trouble. All I had to do was put shoes on my feet and go outside. One foot in front of the other and I was off. I kept making excuses in the beginning about wanting to lose weight first so I wouldn’t damage my back or knees. Making excuses isn’t starting though and that bugged me a lot. It was something I wanted but I just didn’t know how to start. At 260 lbs the only thing I had going for me was a little endurance from being a walker. I was way out of shape for the task at hand. After some research I found out about the Couch to 5k interval training program. It was started by the folks over at Cool Running. C25k takes you from a couch potato to being able to run three miles non-stop. It does this with three workouts a week that are a combination of walking and jogging. Each workout lasts roughly 20 – 30 minutes and you should hit your goal at the end of week 9. Speed is not important in the program. The key is building strength and endurance. Best of all, the program is also very beginner friendly. I had been using a cool GPS tracking application for a while to measure the speed and distance of my walks called Endomondo on my Android phone. This application tracks speed, distance, and route traveled and then optionally uploads the information to a fitness oriented social networking site. Naturally it also has the option to update Twitter and Facebook if you wish. The application is available on many platforms including iPhone and Blackberry as well. The idea of using this wonderful application to track and create a history of my runs added to the fun factor. Following the program during the run can be accomplished a few different ways including the simple use of a stop watch. Being who I am, I found an application for that instead. The Android C25k application comes in a free and paid version. For the couple dollars it cost and after having tried the free version, I got the paid version. The application is simply a fancy timer with audio cues and has the entire program already in it. It keeps track of the days you complete for you so you don’t have to wonder which one your on. You simply select the week and day you’re doing and press start. After that, it will chime when it’s time to run and when it’s time to walk. It couldn’t be easier. The running has been going well. I just finished week 5 day 1 last night. This Friday will be my first non-stop jog for 20 minutes (2 miles roughly). The route I have to work with is not level ground at all. The steep hills add quite a bit of challenge to the process. In a way, I prefer it that way as it adds an extra sense of accomplishment to each successful run. In addition to C25k, starting this morning, I’m trying to run a quick daily mile in the mornings to start my day. This is entirely optional and due to my enthusiasm for running. The weight loss is finally starting too. I’m eating better because my body isn’t happy with the junk I feed it now. I’m not focused on the weight though. I didn’t run to lose five pounds. I lost five pounds because I’ve been running. I don’t think of it but it’s fun to watch. I’m excited that I can do this. The whole family has been very supportive. My son runs with me and even my nephew who’s visiting with us for the week has been coming along. Who knows where this will take me next. A 5k marathon is not out of the question at this point. The Christmas season is finally here and, for once in my life, I am actually ahead of the game. The majority of the Christmas presents have been ordered and delivered thanks to Amazon. There is still a little bit of shopping to do at home but even the kids are pretty much taken care of at this point. On the whole, I’m feeling far less stressed out about the holiday than I’ve typically been in the past. This sense of good humor has translated into my work place. Normally there is always much to get done. Once in a while, the company picks a day to slow down though and yesterday was the “Winter Celebration” event at work. Essentially it boils down to food, games, and silliness. I have one coworker in particular, Erin, who is normally remarkably self assured and intelligent. It’s pretty hard to ruffle her feathers. As luck has it we caught her during a moment of weakness. With very little coaxing we got her to try the jumping game in the arcade. She had no idea how the thing worked and we were highly amused at watching her try to figure it out. Office pranks seem to be much more common these days. As insurance becomes more expensive and benefits keep getting cut back, it seems like we are attempting to compensate by adding laughter to the office. Erin has a great sense of humor which has really brightened up the office. Does your office have an Erin? What sort of things to do you do at the office to reduce the stress? I’m currently in the process of preparing to run a campaign using the Hellas: Worlds of Sun and Stone RPG. I first learned of Hellas during GameStorm 11 last year. The authors had a booth and I was lucky enough to sit down and play in a game run by Jerry Grayson. Hellas’s game engine is built on the OMNI system from Morrigan Press. The basic premise for the system is all roles are made on a single d20 with modifiers then compared to a single results table. I feel the simplicity is the systems real strong point as it allows you to focus on the characters and the situation instead of crunching numbers. The setting is a blend of ancient Greek ideals and theology mixed with futuristic alien races and technology. It should be noted that Hellas is not Greece as we know it but is simply inspired by the culture. Because of the game embraces a few adult concepts, this would not be a game for younger players without being heavily modified. The player characters are constantly striving to find their places among the gods through glory and actions. And as with ancient Greek heros, it may take generations before the legacy is fulfilled. The game plays into this by offering a system where after your character dies, the new character gets written into their history and carries on the legacy left behind by the fallen hero. This might be a son, daughter, apprentice, or even friend of the family. This is why it is said that the character a player starts a campaign with will likely not be the one they end it with. I really look forward to running this game with my group. For anyone interested in trying it out for the first time, they have a preview of the game available for download at their website. If you do give it a try, stop by and leave your feedback. I’d love to hear how it went.